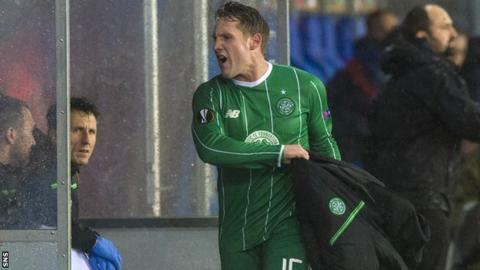 Celtic manager Ronny Deila described Kris Commons' reaction to being substituted in the defeat by Molde as "unacceptable" and "disrespectful". Commons, who scored in the 3-1 loss in Norway, vented his anger towards the Celtic coaching staff after being replaced with Nadir Ciftci. The Scottish champions prop up Group A with two points from three matches, while Molde lead on seven points. "That's something we can't have," said Deila of Commons' reaction. "We are a team. I understand that players can be disappointed at being taken off, but to show it in that way, it's not how we want to have it in Celtic. "We are one team and it's not about one player. It's very disrespectful to everyone else. That's unacceptable. "I've spoken to him, of course. This is not about punishing people, it's about understanding and about talking about how we react and how we behave. "He was irritated he was taken off. That's OK, sometimes you are irritated, but you do it in a better way than he did." Deila explained that he had taken Commons off because he did not want to upset the balance of the team. "It's always a matter of having balance between attacking and defending because you can't put on four strikers and think that you'll create a lot things," added Deila, who took Commons off with his team 3-1 down. "You need to have somebody who can defend as well so we can have the ball. "Today we wanted to have two strikers on and then we needed also more balance in the midfield because you saw that, every time they got the ball, they counter-attacked us, so that was the decision. "Of course, it's a lot of games coming and Kris is going to be important in them as well." Ola Kamara struck to put Molde ahead after Celtic had started brightly at the Aker Stadion. Vergan Forren's volley soon after made the visitors' task all the more difficult, with their defence continually stretched. Commons capitalised on a mistake by Molde to give Celtic hope after the break, but, almost straight away, Mohamed Elyounoussi squeezed a shot past Craig Gordon for Molde's third. "We performed not at the level that we should do," said Deila, whose side next face Dundee United in the Scottish Premiership. "We were uncomfortable on the ball. "The game went the way they wanted it. They won the ball in good situations and counter-attacked us. We should've created more. "We were not switched on enough. It went everything too slow. "I'm very, very disappointed of course. We will move on and come back strongly on Sunday." Celtic host Molde in the next round of group fixtures on 5 November and Deila says his side need to win in order to keep alive their hopes of progression to the last 32. "It makes it much harder, but we have two home games," he added. "There's still a chance, so that's positive, but we need to win against Molde and also against Ajax at home. "Then we will see what kind of position we have."